The Father of Modern Art…Picasso? Nope. Linda Blair, renowned San Diego Art Historian, asserts Paul Cézanne, French painter in the latter part of the 1800‘s, as the precursor of Cubism and hence, the true Father of Modern Art…not Picasso! Linda Blair’s vivid interpretation of Basket of Apples gives us that ‘Aha’ moment! Surprisingly, we now understand Cézanne’s painting with all its ruthless brushwork, tension, and distortion! “In Basket of Apples the bottle tilts toward the basket to halt the tumbling apples, while the cloth seems to slither off the table but is itself halted by the higher right side of the table. The curious perspective of the cookies in the upper right suggests their desire to move downward to join the apples. The misalignment of the table confuses visual expectation and furthers the tension. Test your Cubism knowledge and watch this video! I prefer Cezanne’s style of Cubism. Art historians have a tough job, and I’m sure they must constantly contend with a proclivity to find the precursor of any trend; however, in this instance, I feel we can be content to view both artists as masters of their craft w/o dabbling in what can only be called forced “chicken-and-eggism”. Hi David. I just posted a general answer to the comments – just let me say that Cubism doesn’t necessarily imply cubes per se, but refers instead to any splintering of form. (As you know, this generation of artists – coming into maturity in the 1860’s – realized that traditional art was moribund, finished… so their challenge was to explore traditional pictorial values, including form, to see what more, could be said and done. So form got broken up, sometimes likened to shards of glass … and if you want to be philosophical, you can say that form is now approached simultaneously from several sides, thus implying the viewer is moving through space and time, and making the viewer complicit with the subject matter, a part of the art itself. Sounds pedantic, doesn’t it? Sorry. 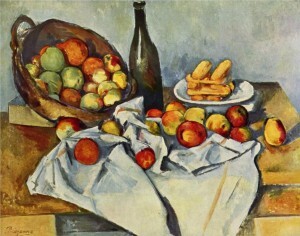 Sorry, I can’t see that Cezanne, especially in this painting, is any kind of precursor to Cubism. I think the position of the wine bottle, the cookies, etc. are just there in the service of the composition. The tilting and “misalignment” of the table and cloth are simply a small visual “trick” to enhance “visibility” of the subject matter. The same technique is used in opera presentation, where the backside of the stage floor is raised subtly, for viewing from above, and opera set designers are not therefore alleged to be “cubists.” Further, I think that a lot of what he does here is to avoid the perhaps boring linearity of classicial perspective when applied to the small surface area of a table top. I have heard Cezanne was the Father of Cubism and Modern Art. He certainly was adept in using alot of negative space, so the paintings breathe. However, I agree that it is difficult to see his cubism, albeit there are many swatches of rectangular color to interpret mountains, etc. Reluctant to join the chorus, Kirby, but I don’t find a convincing argument in your description. Cezanne is valued and appreciated for what he is – a beloved impressionist. As for jilting Picasso as the father of cubism, I could care less. He is an accomplished father of other arenas. Linda, although I’m not an artist, I do thank you for taking the time to respond so thoughtfully to my cubism comment on Kirby’s blog. Do you know her?